Jose Cuervo revealed new packaging for its best selling line of tequilas, Jose Cuervo Especial Gold and Especial Silver. Demonstrating its 10 generation-strong company and family motto of ancestry, prestige and tradition, the design changes reinforce the company history with an authentic new look. With distinct new features, the bottle professes originality with sleek, hard lines. The labeling, equipped with a new neck design, distinguished watermark and belly band, characterizes Jose Cuervo’s long standing tradition. The history inscribed on the back label pays homage to the commitment of preserving craftsmanship, rich Mexican heritage and family tradition that stretches back over two hundred years. Other notable changes are the embossing of the Jose Cuervo signature prominently displayed on the side profile and bold cap colors – deep red for Especial Gold and royal blue for Especial Silver. Jose Cuervo Especial Gold is made from a special blend of reposado (rested) and other fine Tequilas. Its smooth, distinct flavor is perfect for shots and sets the ‘gold standard’ for margaritas. Jose Cuervo Especial Silver is bottled immediately post-distillation and is noted for its exceptionally smooth, distinct flavor. The new packaging will now be available nationwide wherever Jose Cuervo Especial is sold (grocery, liquor, club and drug stores) in 50mL, 200mL, 375mL, 750mL, 1L and 1.75L sizes. Suggested retail price for Especial Gold and Silver is approximately $17.99 per 750ml bottle. Please enjoy Jose Cuervo Especial responsibly. 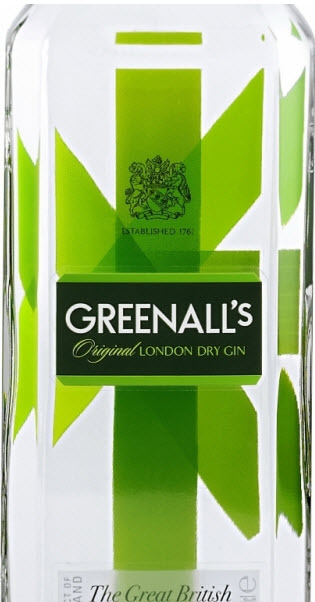 G&J Greenall’s London Dry Gin is celebrating its 250th anniversary with a new look and repositioning strategy courtesy of brand and design consultancy, Dragon Rouge. According to Marcus Hewitt, Chief Creative Director, Dragon Rouge, “The objective was to create a new visual identity and package design to increase shelf impact, build awareness and appeal to a new generation of gin drinkers.” The studio started by defining the brand essence as, ‘The Great British Spirit,’ which directly references the brand’s origins and traditions and then focused on creating a new visual identity that combines tradition and heritage, but with a modern twist. A bold and clean logo replaces the old script one and rests prominently on a contemporary dark green square label. ‘The Great British Spirit since 1761’ at the bottom of the front panel, reassures customers of its tradition. A proprietary green abstract ‘Union Jack’ on the inside back label acknowledges the brand’s heritage, but provides the edgy new look and feel. “While we took influences and inspiration from the past, we were able to bring the brand into the future, making it more relevant to today’s consumer,” adds Hewitt.